Human resource law is a complex, confusing compilation of federal, state, county and city laws and ordinances cured in the crucible of the courtroom. 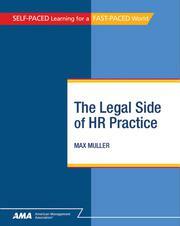 The Legal Side of HR Practice leads human resources professionals, managers, supervisors, and students through the legal maze to an understanding of HR law fundamentals. Written in a conversational, easy-to-understand style and filled with workplace examples and step-by-step explanations, this course is designed to provide readers with the tools they need to legally recruit, onboard, manage, discipline, and lead others. Throughout the course, exercises, scenarios, sample problems, and Think About It sections provide readers opportunities for practice, feedback, and application. Additional forms, lists, and reference information to supplement the text of this course can be found online. This is an ebook version of the AMA Self-Study course. If you want to take the course for credit you need to either purchase a hard copy of the course through amaselfstudy.org or purchase an online version of the course through www.flexstudy.com.